Reconstructing our built environment requires that we rethink what we construct and where, as well as how we design, insure and finance projects, to reduce the potential for costly consequences due to catastrophic loss of life and property resulting from climate change and extreme weather. Industry-leading architects and engineers in private practice and within the U.S. government are now changing their conceptual planning and design approach to incorporate systems analysis, statistics and probability, and Risk-Informed Decision Making. Understanding the potential for, and likelihood of, loss (including the impact to property and casualty insurance costs), is emerging as a new standard of care in the design profession. My company, GZA GeoEnvironmental Inc., has been in business since 1964 and provides geotechnical, environmental, water, ecological, and construction management services to a wide array of private and public clients. We employ about 650 engineers, scientists, construction managers, and support staff in 27 offices located throughout the New England, Mid-Atlantic, Appalachian, and Great Lakes Regions of the U.S. We have been proactively and aggressively innovating to help our clients prepare for and manage risks due to the impacts of climate change and extreme weather events. At a macro level, towns, cities, counties, and states are, for the most part, only beginning to address the need for innovative financing methods to encourage community resilience in areas vulnerable to the impacts of climate change, sea level rise, and flooding. Simply put… How can we make sure that the social and economic value of investing in resilience – for its own benefits and for loss avoidance is recognized and measured? What can make proactively investing in resilience before the next storm pay back for the vulnerable populations? GZA has been closely involved with one such major effort, with the State of Connecticut, that I recently described in a paper co-authored with colleagues in Sea Grant Law & Policy Journal. 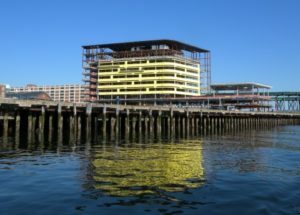 Connecticut experienced significant loss from the October 2012 Superstorm Sandy and has proposed and launched new finance mechanisms including several low-interest, affordable, state-run resilience loan and financing programs. 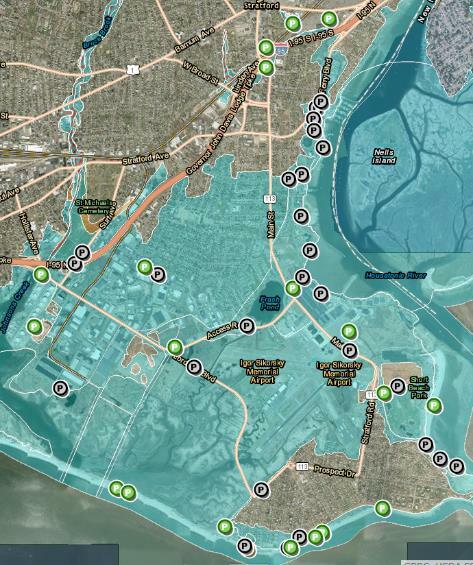 GZA uses modeling linked to GoogleEarth 3D to advise urban clients on potential impacts of sea level rise & storm surge. Examples include Shore Up Connecticut, the Connecticut Clean Water Fund, and a grant and loan program to support construction of community “microgrids” that provide backup power to public safety buildings and community shelters during severe weather. 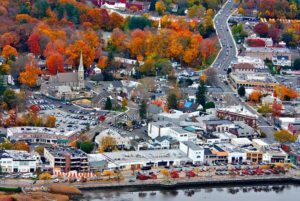 During 2015, Connecticut approved a model for “tax increment financing (TIF) districts” that allow communities to finance economic development projects with bonds repaid by the increased tax revenues levied on improved properties. We have seen significant interest in using environmental and social impact performance bonds, green bonds and TIFs for resilience-improving projects, on the theory that in some cases, this approach may ensure the continued existence, and municipal property tax base stability, of valuable properties that otherwise could be destroyed by the next Sandy. Another approach that GZA is helping refine and build support for is called Property Assessed Resilience financing, or PAR. This program combines loans for residential resilience retrofits with an assurance of reduced future insurance premiums on properties made more climate-resilient, with loans tied to the property, not its current owner, so the loans are fully transferable when the home is sold. An improved Community Rating System (CRS) insurance score in FEMA approved CRS communities that potentially lowers flood insurance premiums for all the residents of a CRS city or town offering PAR loans. 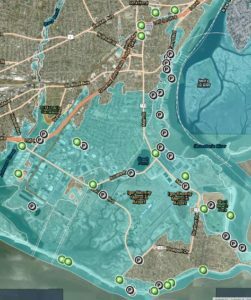 On a more micro level, an engineer working on an infrastructure project adjacent to a river or coastline before 2014 would have typically relied upon a FEMA Flood Insurance Rate Map (FIRM) to determine whether the structure was vulnerable to flooding. In addition, there would likely not have been any building code requirements to address acceptable flood hazard risk levels or flood resistant construction requirements. This “FEMA map look-up” approach, still in use today, is an ineffective standard of practice for several reasons. First, there is a general lack of understanding on the part of engineers and owners as to the fundamental intent, purpose and proper use of FEMA FIRMs. FEMA FIRMs are principally developed for use in establishing flood risk and insurance premiums under the National Flood Insurance Program (NFIP). They define the current flood risk associated with a 1/100 chance of being met or exceeded in any given year (referred to as the FEMA Base Flood Elevation, aka the 1% flood, aka the 100-yr return period flood). The FEMA Base Flood may not be the appropriate level of risk to be considered for design based on the critical public safety function of the structure (e.g., bridges are designed to a 1/1000 chance earthquake). Further, FEMA FIRMs do not consider the effects of climate change, such as increased intense precipitation or sea level rise, which will increase the flood elevation levels associated with specific probabilities and likelihood of occurrence. Lastly, the FEMA Base Flood Elevation is an annual exceedance probability. The risk is cumulative, not static, over life of the structure. For example, the FEMA Base Flood (which has an annual exceedance probability of 1%) has about a 25% chance of occurring at least once over a 30-year mortgage period. After floods damaged property & transit infra-structure along the Muddy River between Boston & Brookline, MA, GZA helped the removal of two culverts and the restoring & daylighting of the river channel comply with USACE permitting. Watch project video. So, as demonstrated in recent years in Texas, the actual risk of flooding has been both misunderstood and underestimated in land use permitting, approving investments flood control infrastructure, policy making, engineering and design. And climate change is increasing the frequency of so-called “100-year return period flood”. The consequences are loss of life, significant financial loss and disruption of business. Extreme weather disasters currently cause over $1 billion in damage in the United States roughly every three weeks on average. Engineers, architects and contractors now must consider both risk and uncertainty and realize that extreme weather events will occur with increasing frequency, intensity and cost. In response our profession must include measures to mitigate this climate-related risk. Planning, designing, engineering, financing, insuring and operationally and financially managing this residual risk will result in a new “risk-informed” standard of care in our profession. 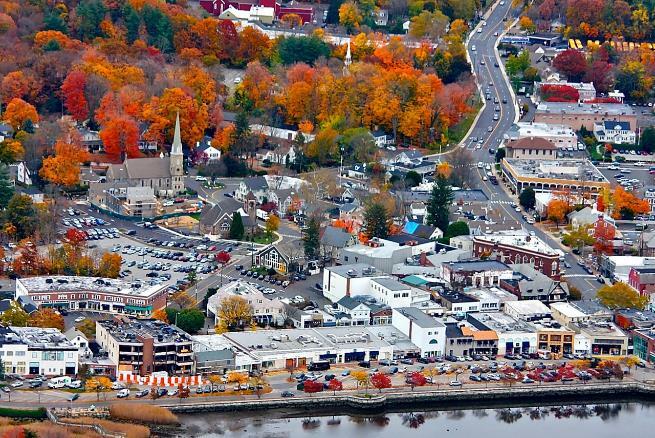 Stratford CT retained GZA to develop a Community Resiliency Plan after Superstorm Sandy. Mapping of hazard layers using GZA GeoTool™ depicts inundation for flooding probabilities. Predicting and communicating risk is a challenge. GZA has long been committed to the use of 2D and 3D hydrodynamic modeling and geospatial information management software to evaluate and visually illustrate flood risk. We are proactively adapting our engineering and design methodology, across all client sectors, to incorporate risk analysis and resilience. This approach is in alignment with on-going but relatively slow and incremental changes to International Building Codes, U.S. building codes and their state and local regulations. This new risk and resilience-based approach to design is smart business practice and in the best interests of clients. “Early adopter” clients including real estate owners, insurers, municipalities, corporations and investors are getting on board with this approach. Also, conflicting regulations often exist. For example, zoning regulations may limit building, and if a developer raises site and first floor grades to be resilient, they may be penalized by having to eliminate a floor due to height zoning regulation. As a positive example, New York City has amended its building codes and height restrictions in response to Hurricane Sandy to promote, rather than discourage, flood resilience. 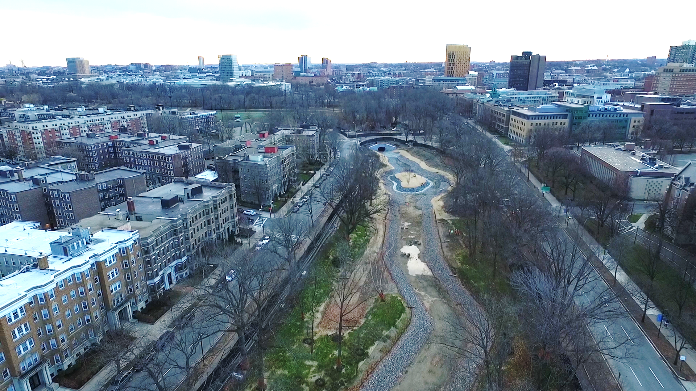 Spaulding Rehabilitation Hospital in Boston was designed with hurricanes in mind. GZA was the coastal engineer on the project. 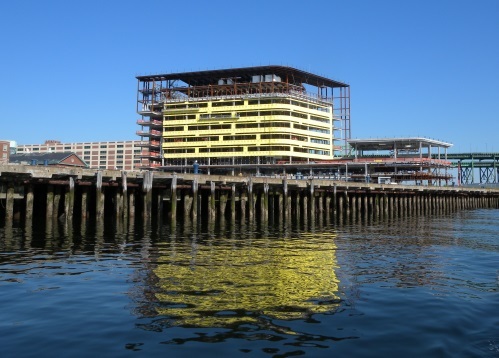 Featured in the ULI Report: Return on Resilience. Yet another example of how regulatory regimes need to catch up to climate change – resilient design and planning: An emerging shoreline protection solution in many flood-prone coastal areas is to utilize living shorelines, which are natural resources and landscape materials installed in the tidal zone to absorb and withstand flood tides, enhance habitat, and provide passive recreational space. Living shorelines, however, may not square with today’s wetlands or coastal zone management regulations. In addition, environmental regulators have been slow to allow including “hard structures” into living shorelines to increase their ability to withstand surge and heavy wave action from storms (known as hybrid systems) which limits their protection value for flood protection. Ultimately, any proactive investment to make communities and structures more climate-resilient is an investment in our future health and welfare as a society. The past and present approach to investing in disaster recovery after the storm is not sustainable. We cannot expect different or better results from continuing this reactive approach in the future. Mitigating and preventing property damage will pay broad dividends for all of us in lower disaster recovery costs for taxpayers, stable property taxes, more affordable insurance premiums, and less social and economic disruption than we would otherwise pay for or experience in the future. The big challenge, of course, is figuring out an equitable method to share the benefits and costs of these improvements in resilience. It is exciting and inspiring to be involved in development of innovative solutions to these challenges and to collaborate with a diverse group of stakeholders from public and private practice, government, academia, attorneys, architects, and real estate, finance and insurance professionals. For decades, engineering firms have been the ones designing foundations and culverts and revetments and levees to manage flooding and weather impacts. Now we have a critical role to play in helping our clients understand and weigh risk and the opportunity to employ resilient design choices – and lead the public discussion over policies to reduce taxpayer exposure and ensure that the value of resilience investment is recognized and captured. Sea Level Rise Projections for the State of Connecticut. November 2017: USGBC releases new building & design standard for resilience. 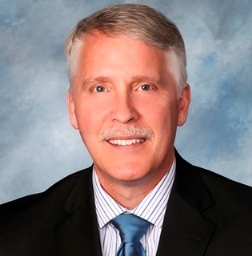 Wayne Cobleigh, CPSM is Vice President of Client Services with GZA GeoEnvironmental, Inc., in Norwood, Massachusetts. Mr. Cobleigh advises GZA’s clients within the real estate development, energy and infrastructure, and buildings practice areas. At GZA, he helps establish multi-firm project teams and develops strategic alliances with architects, engineers, attorneys, regulators, construction professionals, and other consultants in the design, renovation, and construction of buildings and infrastructure. His experience includes addressing: federal, state, and local permitting, siting and foundation design issues on due diligence, land development, building renovation, and construction projects impacted by environmental conditions and the presence of contaminated soil, groundwater, and hazardous building materials. Mr. Cobleigh is GZA’s primary contact for corporate membership in the U.S. Green Building Council, and he is Vice Chair of the Connecticut Green Building Council. He focuses on sustainable site development, and geothermal, wind, solar, biomass, nuclear energy, and transmission line project development. He has over 35 years of consulting experience, assisting clients on a wide variety of regulatory compliance and business solutions.